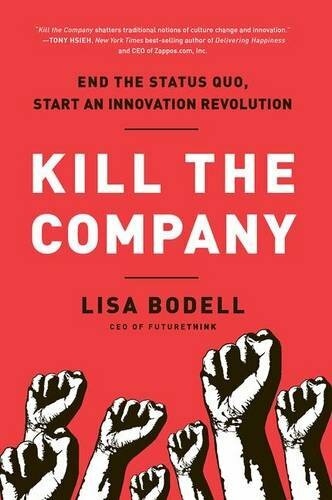 Lisa Bodell, founder and CEO of futurethink, is the bestselling author of Kill the Company, and her latest Why Simple Wins. She is a recognized global leader on innovation foresight and change management, whose keynotes leave audiences inspired with a vision and armed with tools towards action. Gail Davis: Today's guest on GDA podcast is Lisa Bodell. Lisa is a best selling author and the founder and CEO of Future Think. As a globally recognized [00:01:00] expert on innovation foresight, simplification, and change management she has helped thousands of senior leaders ignite innovation at companies like Google, Pfizer, Citi Group, Lockheed Martin, and more. Lisa has inspired over 100,000 attendees in 30 countries with radical thinking and on the spot business solutions that motivate people and organizations to action. Her presentations are frequently the highest rated sessions [00:01:30] at conferences. She has a new book on how to simplify things and that's a topic that really resonates with me so I am very excited to welcome Lisa to today's episode of GDA podcast. Welcome, Lisa. Lisa Bodell: Hey thanks for having me. Thanks for the great intro too! Gail Davis: Oh you're welcome. Kyle Davis: Second time's a charm, right? Gail Davis: Yeah we had a little Monday funday here but we're good. Kyle Davis: I don't think it's Monday Funday, it's Sunday Funday, but neither here nor there. Right? Gail Davis: I was trying to be [00:02:00] hip and kind of ... You know, trying to, you know, do that. Kyle Davis: It's a case of the Mondays. Gail Davis: Lisa this concept of simplification. How did you land on that? Lisa Bodell: So you know it's interesting. It was one of those happy accidents that grew out of a problem I was seeing. You know, we go to a lot of clients as futurists and innovation experts and we help them teach change, right? And innovation what was interesting to me was all these incredibly smart, driven leaders [00:02:30] that were having issues like they get so much done every day on their to do list yet they still felt like they weren't getting the things that were important. Or there are people that really wanted to innovate but they just couldn't seem to get to it because things were getting in the way. And I wanted to find out why. You know, here's all these smart people, they've got lots of money, they've got big organizations, they've got good resources, what's holding them back? And I asked them what they spent their day doing. And the answer was meetings and emails. [00:03:00] And so I realized everyone's drowning in the mundane work and they can't get to the work that matters because they're focusing on the wrong things. So this book set out to have people realize that we've got stop the complexity so we can get to the work that makes a difference. Gail Davis: How important ... Oh sorry, Kyle. Kyle Davis: No worries. One of the things that I found interesting, because you mention like frivolous meetings and one of the things that I've learned is that Google, after they have a meeting they pass around a survey [00:03:30] to see if that meeting was impactful. And I'm wondering is that what we're talking about? Is the meeting that we're leading, did it make a change, did something come out of it? Or are we trying to say that just these frivolous, mundane meetings where we're just kind of checking in and dipping our toes in the water? Lisa Bodell: I mean, what I mean by meetings and emails I think is it's not just how many of them do we have, and how good are they, it's are they even necessary in the first place. I mean a lot [00:04:00] of this is about how do you approach everything with simplicity. Do you need the meeting, do you need the email? Can you have better decision making? Can you streamline a process? Can you kill a stupid rule? There's lots of different ways that complexity happens. Most of it is on the day to day level which is great because that's things that we can control. But I think when people think of meetings its not just making every meeting better it's deciding, "Do we need that meeting in the first place?" Do those people need to attend? It's a subtractive process and its focusing [00:04:30] on less, not just more and better. Kyle Davis: And that's what I was trying to get at is that with these Google post email surveys that they send out, post-meeting surveys is was that meeting impactful and is it something that we should do again and so I think its something interesting, I mean that's just an anecdotal way of coming about it but I think to your point it'd be very interesting to see if people when they have these meetings or they have these task or administrative functions built into their work flows is it really needed. Lisa Bodell: Yeah, [00:05:00] so I completely agree because I think that anecdote that you told from Google's a good one. We've had clients such as Merk, such as Sprint and other groups within HBO that literally have held Kill The Stupid Meeting sessions and the idea behind that is, let's audit all the meeting for example so that's a problem. Let's audit all the meetings that we have and let's decide which ones should we eliminate immediately, then let's decide which ones should we just do less frequently. And what that does is it gets people in the mindset [00:05:30] of less versus more and that's important because what we value in companies and what we reward people for is more. And people can't take on more. So what they need to figure out is how can we start to reward and get in the mentality of less because that creates space for thinking to happen. Gail Davis: I'm also curious how important culture is when trying to foster simplification. Lisa Bodell: It's critical. I mean, to me that's the most important thing because I think, especially [00:06:00] over the last, even 5 years people have really focused on having an innovative culture. And we spend a lot of money and we talk about it a lot and my reaction is, "Well then why don't more people have a great culture?" Gail Davis: ... When you're evaluating an employee's performance? Lisa Bodell: You know, I love that you brought that up. We came up with this [00:07:00] whole toolkit and one of the last tools I really thought to put in it was metric for simplification and for a couple very specific reasons. First because we have to make sure with management that we reward people for less. Because think about it. Today people are rewarded for doing more. Managing more people, more projects, more geographies, more processes and so that forces them to put more in place even if it's not valuable. And so number one it's getting them in the mentality [00:07:30] but the second thing is giving them metrics that help them understand what to measure. So is it ... One it can be quantitative, like less meetings, less emails, less layers of decision making, less layers in the organizational structure. But it can also be behavioral. More people saying, "No." Less people creating a false sense of urgency. So it's really ... It's cool because it also ... It's tactics and it's behaviors and it's really when you get to [00:08:00] the behavioral part that it sticks. Kyle Davis: ... When someone talks to you. When we're talking about changing behavior, changing cultures, empowering your people to say, "No I can't make that meeting," or making a meeting optional [00:08:30] for some people that may seem like a lot of heavy lifting but what do you say to them when they hear that idea? Lisa Bodell: Of changing the behavior you mean? Kyle Davis: Yes of changing the behavior. Lisa Bodell: Well I think its a couple things. One's it's making sure that management walks the walk. Because if management or leaders don't do it, people won't do it underneath them. So for example, everyone wants to say no but until their boss does it they are absolutely not going to do it because they're afraid they're going to get fired. So a lot of the issue around complexity is driven [00:09:00] by human behavior it's risk, fear, power, and control. And if you can start to show that leaders are okay with taking the risk, letting go of power, not needing to have 17 reports so they have more control then the behavior starts to change. So one of it is leaders embracing it, but the second thing is it can be mandating people to do it. Because even though people say they want to do it they don't know how. So let me give you an example. One [00:09:30] group I know within Standard [inaudible 00:09:32] was really upset because they felt like they weren't able to make decisions and they kept going to their boss and saying, "You know we really want to be able to make more decisions." And he said, "Okay." And so then a few weeks later he realized no one was making any more decisions. So he started ... He went to a status meeting and he said, "Guys, listen. I'm going to make sure that at the next status meeting next week that each of you comes in and tells me two decisions that you made without me. You must come in [00:10:00] and tell me two decisions you made without me." And they were kind of stunned. 'Cause now you were forcing them to do it and I'll tell you, he said the first few days people kept emailing him saying, "Can I invite so and so to this meeting?" And he would email them back and say, "That's a decision you can make without me. I told you you can do it." And at the first week he had 10 people in this group, they each made two more decisions without him. That was 20 less decisions he had to make that week. And he just kept upping it and upping it until the end of the year he actually had free time on his hands and everyone felt more [00:10:30] empowered. So that's my long way of saying it's walking the walk but it's also sometimes mandating it so people get comfortable with this subtracting or this empowering behavior. Kyle Davis: So one of the things that you just mentioned though is like a forcing mechanism like next week when we talk tell me two ways that you made a decision kind of by yourself but when ... And that's great from like a top down kind of perspective but I guess what I'm trying to get at is when you're telling these leaders, "Hey these are some changes that you need to make," [00:11:00] and it's counter to everything that they feel what kind of resistance are you getting from them and then 2, 3, 5, 6 months down the road what are they telling you afterwards? Lisa Bodell: No no, and then that starts to change the behavior. The thing about complexity that's really interesting or simplifying is it's contagious and people are jealous of it. If they see that you're able to do it and you have permission to do it, they want to do it too. Kyle Davis: Yeah I couldn't agree more on that one. It's ... There's so much simplification that can happen on an individual level but once you see it happening then it [00:12:30] kind of gives you the permission structure to be able to do it to yourself. Lisa Bodell: That's right. And so that's why we say to people again, within your sphere of control or influence you have to do it within the places you can control first and then work it's way out. Gail Davis: Just to give listeners an example are there ways that you could share with us that you practice simplification in your own work or in your own life? Lisa Bodell: Yep, absolutely. I mean, one of the things that we do at my company [00:13:00] well first of all every year something that we do our annual meeting we review our numbers and then we set aside a couple hours at the end of that day to kill our company. And what that does is we identify all our weaknesses, all the places where there's redundancies, complexities and do our best to eliminate those. And then we end the day by killing stupid rules. And killing stupid rules is something we do annually but then we actually do mini versions of it every quarter. And what we do is [00:13:30] we have everybody list the two rules that they wish they could kill or change to help them be able to get to more valuable work. And it's fascinating because what it does is it, as a leader, it lets you see what really holds other people back. Because leaders can be disengaged in the every day work. They don't realize what holds people back. And the other thing is it's very cathartic, it sends a signal to people on my team that I'm counting on you to identify the things that aren't working and the goal is to get rid of that. So those are our favorites, killing [00:14:00] our company and killing stupid rules 'cause its a constant spring cleaning that we practice that becomes every day behavior. Gail Davis: That's a great takeaway I love that. I'm going to borrow it Lisa. Gail Davis: I'm going to borrow it. Is simplification ever a bad thing? Lisa Bodell: Yes. You know what, I really ... I'm glad you brought that up too. I was surprised because I thought the answer to that was going to be, "No." I mean what could be bad to getting down to the essence? But you can oversimplify. And anyone that's ever picked up an Ikea catalog [00:14:30] or instructions and tried to put something together knows that sometimes it's a little frustrating. But there's a great example I use that a division within GE, they had a great goal of getting down a contract from ... To minimize from 100 pages to 1. Let's get it down to 1 page, which I think it's good to be extreme when you simplify because it pushes people to really ask themselves, "What if we didn't?" Gail Davis: You ... Go ahead Kyle. Kyle Davis: One of the things with regards to simplification that I'm reminded of is prior to my time working at Square, I want to say it was like 2 or 3 months prior to that they actually did away [00:15:30] with job titles and it was like an exercise in trying to make everybody equal and removing kind of these barriers and empowering individuals to be like their own boss. But what that ended up causing was just a lot of confusion and frustration as to who's doing this meeting, who's setting the agenda, who's doing what, this, that, and the other. And it was just the simple act of just removing job titles. So there are ... That's one ramification that's just top of mind for me. Lisa Bodell: Well you know, I love that. That's [00:16:00] such a great example because I feel like we vacillate in companies from like too little to too much so that's a great example of people all the sudden wanted to, they just want to throw the baby out with the bathwater. It's not about getting rid of the handcuffs it's about keeping guardrails in place. Right? So people just need to know their boundaries and they just don't want to be too confined within them. Gail Davis: How [00:16:30] important is discussing simplification with potential new hires? Lisa Bodell: Oh I think very much so because what it does is it sets the tone for, "This is the way we work." This is the mindset of everyone here, we expect you to only work on the meaningful and essential and if you're someone that spends too much time on mundane tasks you're not adding value and you're not going to be here long. The other thing that I think is cool about [00:17:00] that is cultures that are simplified, there's no where to hide so people that [inaudible 00:17:05] for confidence ... They can take risks within boundaries, they're not afraid, they're transparent with their work. They don't try and hide their work so they can be important and be the only one that does that job. You know those ... It's the cultures that are too complex that allow mediocre people to hide. And so if you go into a company that's simplified, that's a confident, smart culture. Kyle Davis: [00:17:30] When you look at like the different type of organizational structures that you see within companies today, I mean, just top of mind for me you see these more legacy companies that have like the very traditional hierarchical pyramid if you will of leadership and then you look at a lot of these like flat organizations out in Silicon Valley and all the start ups, I mean, and they have their pros and cons but I guess what you're suggesting is when you have a simplified [00:18:00] structure, a simplified way to get to something is that where your ... The simplicity or the ease communication comes from or what? I'm ... I apologize for the wordiness of that question. Lisa Bodell: Well I do think that there's ... It's not just about structure so you mentioned structure and it's not ... Again, it's not complex structure or flat structure. There's lots of large organizations. Google's a large organization, Merk is a large organization and they have very ... Parts of them that are very simplified [00:18:30] and the reason I'm saying that is it's ... They boil it down until as much as possible. So for example they make everything as minimal as possible, understandable as possible, repeatable as possible, accessible as possible. They get rid of layers so for example we know divisions within Merk in Canada where they actually made it so that there are only two layers needed in any decision so they streamline [00:19:00] decision making and they streamline their org chart. Is it perfectly flat? No. But it is certainly simplified in such a regulated environment. Kyle Davis: Got it. Go ahead. Lisa Bodell: Well so structure plays a part of it but the other thing is even the way that they approach products with features and functions, right, you can add on only what's necessary, that's another rule of thumb that happens. Like within Google we know with some of their divisions. We also know within, let's [00:19:30] take HBO which also has a complex but fun environment. They're not perfectly flat but they are certainly, in how they operate, you're allowed to go around things. So the thing about simplicity is it's about speed not size. That's really what it gets to. So as long as there's a way within the structure to operate quickly that's when simplicity can happen. Kyle Davis: I'm glad that you brought up design when it comes to solutions that maybe Google puts out or some of these other companies 'cause what you start [00:20:00] to see is like, if you have simplicity in design in the product there tends to be a lot of simplicity in the way that the company itself is structured. That's like my first observation when I think about good design. But then the second thing is being able to move about to get to something and being very empathetic for the consumers and they do that through simplifying if rather than making it overly complex and I'm just wondering if you had some thoughts on that. Lisa Bodell: Yep. Well one of the things that we found [00:20:30] was simplicity isn't necessarily about the size of the company it's the culture and the mentality. So for example, you can look at companies like ... Let me say it a different way. What simplicity lets them do is ... If you look at a company that is simplified they're focused externally on the customer because they're simplified internally. If you look at a company that's complex they mostly are looking internally. They're focuses on their internal structures and they probably have a [00:21:00] negative or bad relationships with their customers because that's not their focal point. They're too much looking at meetings and reports and other things inside. So that's the difference between a complex company and a simplified company. It's the inward versus the outward. Gail Davis: I'm curious what role technology plays in simplifying a company. Lisa Bodell: Well that's interesting, people ask me that all the time, they'll say, "Does technology [00:21:30] help simplicity or hurt it, you know, create complexity?" And the answer is, "Yes." So on one level you can see that when you have apps, like I was just using the Cozy family planner app, I was using my MTA train app today and they're so fantastic because they let me access things all the time. But the other problem is just because I can doesn't mean I should. I overuse them and then I have so many things and then I feel like I have to over download stuff and [00:22:00] it can create more complexity and you can see this within organizations where they have sharing tools, they have ways that they can actually create more reports. They can get access to more data than they ever had before so what used to be a report that had 6 metrics now has 25 because they can. So the idea is, again, how can we get comfortable with our decision making, with our ability to take a risk so that we're not relying so much on technology as a [00:22:30] not reason to be able to take a risk but maybe an excuse not to take one at all. Kyle Davis: One of the things that ... I had a mentor look at me and he goes, "You know they're called KPIs, which stands for Key Performance Indicators, not performance indicators." Lisa Bodell: Yeah. Not API, All Performance Indicators. Lisa Bodell: And that's the problem. There was a great example, I was talking to someone out in the field that at IDM who said, I said, "Do you have a culture of complexity or simplicity," and they said, "Well, let me just [00:23:00] give you an anecdote. I started out that everyone has a dashboard and he said it was great, we had 7 key KPIs and what we were trying to do was we were trying to figure out after a product launched how we were doing in terms of sales, velocity, volume, etc. and he said all the sudden people realized it was getting towards the end of the year and that was not just making our numbers but of performance evaluations were coming up. So you had people that wanted to make sure they were going to make their numbers but also make sure they [00:23:30] go their bonuses and look smart. By the end of the year when people kept adding on KPIs every month they had over 25 metrics in that report." And he said, "You know what the most important thing was?" He said, "It wasn't' the metrics it was every manager still wanted to make sure that that report still fit on 1 page." And he said, "I spent all my time formatting that thing down to 4 point type just so it could all fit on one page but nobody could read it anymore." Kyle Davis: Yeah when I think of technology and I think of the different applications that they ... The different ways in which it can benefit you I think a lot of people really ... They miss the forest for the trees and maybe they even get stuck in the leaves 'cause they're always focused on the individual minutia that an app or a CRM or something like that can provide you but they're not really looking at like the bigger picture. And [00:24:30] I think that's kind of where like technology kind of really freaks and hinders people out. Lisa Bodell: Yeah I mean there's a great example with LinkedIn, you know, when they were really growing you remember when they were sending out notices to people every single time in their preferences that somebody updated something, there was a new thing in their feed. People were becoming overwhelmed with announcements. And that's when they started to get all these complaints that they were giving too much choice, they were giving too much communication and that's when they switched to those weekly [00:25:00] digests. Remember this? Lisa Bodell: It was just a few years ago. And when the minute they did that they cut down their email traffic by over 50% and they increased their customer satisfaction by over 40%. 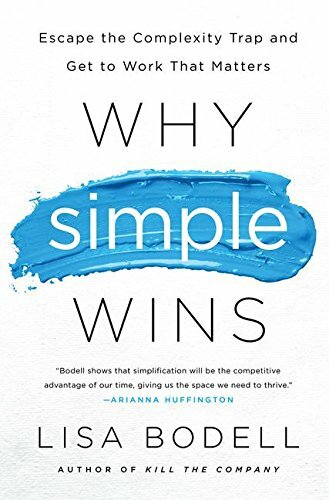 So with simplification came actually a better retention and growth for their market because they realized just because they could didn't mean they should. Gail Davis: That's a great example. By chance do you have another one that everyone can identify with because I think after hearing about all the pros of [00:25:30] simplification now I'm just going, "Okay where do I need to simplify?" And I think that's a great example, the weekly digest. Lisa Bodell: Yep. The weekly digest is a really good one. Yeah, I mean another thing that was really interesting is when we were talking with ... We were talking about the Cleveland Clinic and they were saying how ... What they really did is they talked to people and they said, "What really bogs them down?" And they decided, everyone responded. They said it was meetings, it was emails, it was decision making, it was PowerPoints it was all kinds of stuff. And [00:26:00] at the end of the day they decided just to focus on one thing and it was meetings because they said, "You can't focus on everything." And what they found was it wasn't the amount of meetings, it was the length of meetings. People had all these what they called Zombie Meetings and when they finally audited all their meetings they realized a lot of the meetings they had were recurring meetings that no one ever killed because they just felt bad doing it. And so what was interesting to me was they went through all their meetings and they killed 23% of their meetings. After doing an audit, [00:26:30] and then they also decided to change the frequency of them. And what was interesting was everyone had their defaults of meetings to be an hour. They realized some of their meetings could be only 10 minutes long. So one of the ways that they go their time back is they not only eliminated some meetings but they shortened them from an hour to ten minutes long and the amount of time that they said they got back they equated to be weeks of time during a year. Gail Davis: You've got me fired up. I gotta go, I gotta go reread this book Lisa. Actually [00:27:00] I'm thinking of having my whole team read it. And then we've gotta have the Kill the Stupid Rules session. That's a good one. Lisa Bodell: You know what's really interesting about that is when people, people do kill a stupid rule, what's really magical about that is ... We did it once in Novardis, so here's a really ... So Novardis they're oncology division and they ... Within a regulated environment people tell you that they can't do things because of regulation and that's never the case. [00:27:30] There's certain things of course you can't get rid of 'cause you'll go to jail but the majority of stuff that you can get rid of is not even related to regulation. So we asked people to tell us what are the rules that they wanted to get rid of and then they had to write each of those rules on a post it note and put them up on the wall. And when I stood there with the president of the division and we organized the stuff what we realized was the majority of the things that people put up weren't rules. They were ... They're cultural norms. They're behaviors. They're daily annoyances. That's the stuff that [00:28:00] people really get bogged down by and when you give them permission to get rid of them ... And usually they're things that you have control to do, it frees up an inordinate amount of time. And it really changes behavior. It changes perception. Kyle Davis: Well very cool. Well, now actually now I'm just thinking about one thing though. One of the things that I'm thinking about is that when we had meetings, especially when I was at Square or other tech companies that would send out a post-meeting [00:28:30] evaluation, like "Was this meeting productive ..."
Kyle Davis: One of the questions was what were ... Whether it be key takeaways but more importantly ... And I'm trying to remember what the verbiage was that we used, but what were the deliverables for the next time that we met. 'Cause sometimes you have a meeting just to deliver some news and then that's kind of where it ends but then ... But most of these meetings, the frequency with which is what's going to be delivered on the next time and that's what you're judging the performance on when you get to that next meeting is, "Okay are we going to talk about [00:29:00] these things that we discuss that we were going to talk about the next time?" It's like always having that internal audit of what you're going to talk about and what was discussed. Lisa Bodell: Yeah. You know you reminded me of another thing which is when people complain and I use a lot of meetings and emails examples but a lot of it's about decision making. And one of our clients which is BMS, Bristol Meyer Squibb, one of the things that they decided was meetings are only for decision making. Information can be sent other ways. So when you got to a meeting the key phrase that everyone always talked about was who's [00:29:30] the D? And what that means was if no one could identify who the D was, the decision maker, the meeting was canceled. Because they needed to get to know that there was a decision to made, who the decision maker was, and who was going to be held accountable. And I really liked that. Kyle Davis: Well everybody, find your DM and yeah ... Hold on. Okay everybody, sorry about that, forget about the feedback I hear, I don't know what that was all about, but anyways, if everybody wants to you can find your DM and you can do that, or D and you can do [00:30:00] that by getting Lisa Bodell to come speak for you and you can do that by contacting GDA speakers at 214-420-1999 or by going to GDAspeakers.com. For the transcript and all of Lisa's books and everything else you can find those at GDApodcast.com. Other than that, thank you Lisa. Gail Davis: Thank you Lisa!